Unless you have been lucky enough to stumble by the legendary Fountain of Youth, age will creep up on you no matter what, and bring alongside it those dreaded signs of age -- grey hair. Also unless you are the one lucky person out of every ten to have no grey hair by the time you are of retiring age, you must have resorted to some trick or the other for covering up those greys. Grey hair is simply a part of the normal aging process. 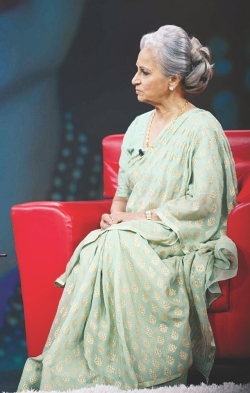 And there is perhaps no better example of aging gracefully than Waheeda Rehman. An iconic actress from Bollywood's yesteryears, Rehman's influence on regional fashion was understandably significant and it is no surprise that the confidence with which she carried her greys also inspired many other women of her era to do so. However, a general fear and skepticism about grey hair continued to exist among many, until quite recently. It is important to remember that the rate at which one goes silver is genetically encoded. Grey hair sprouting up in younger adults, generally speaking, is not a sign of illness. While there are some specific health conditions, such as vitiligo, associated with grey or white hair, for most people out there greying hair is just a fact of life. It may feel like you sprout more greys in the wake of a stressful event, but that is probably due to the fact that middle age is, sort of, a series of anxiety-filled events. What with raising children, working, caring for older parents and running a family, the middle age years can be quite stressful, especially for women. They are also when you naturally start to look older. Applying henna generously was something that nanis, dadis, khalas and fupis of yesteryears mostly chose over the jet black dyes that used to be available back then. Then came along the Loreals, Garniers and Revlons that offered easier application methods and a greater option of colours; options diverse enough for a South Asian black-haired woman to even go blond if she pleased! This was soon followed by streaks and highlights and what not. Many middle-aged men and women in the past decades chose to colour, dye or apply henna to their hair at the very first sighting of grey hair. Now a lot of the new members joining the ranks of the grey hair brigade seem to be doing the exact opposite and instead wearing those greys boldly. People beyond their thirties experiencing the onset of greys nowadays seem to be least bothered about opting for artificial colours and stick to their natural salt and pepper shades. Their style statement being greys are classy and sophisticated; and who better to stand witness to this than George Clooney, who can still make girls swoon, more so for the greys! A lot of celebrities, actors and models in the international arena are sporting greys with panache and some of them are actually dyeing their hair grey like Lady Gaga and original greys are definitely the way to go. Elegance, confidence and taste; grey hair speaks just that, and those who sport it emanate the fact that they are comfortable in their own skin. If you are sprouting your first greys, stick to them and make a statement because grey is the new black! If exercise could be bottled up, everyone would take it. It is by far the best medicine out there for a range of physical and psychological ailments and for post-menopausal women; exercise could be the answer to most of their problems. Regular physical activity has been known to help cope with some of the symptoms of menopause which include hot flashes, joint pains, anxiety, depression and insomnia. In addition to combating these menopausal symptoms, exercise is helpful in curbing other ailments which set in after the age of 50 in women such as heart disease, diabetes and osteoporosis and of course, it helps to keep the problem of weight gain in check. Exercise, even in small amounts, is so potent, it influences every physiological system in the body for the better. Mahmuda Akhter, trainer at Gold's Gym says the first advice to all is the need to consult a physician before embarking on any exercise program. "By the half-century mark, our body is likely to be weakened by the toils of life," she says, "A doctor will be able to tell you which exercises would be most suitable for you." The second thing to keep in mind is that exercise does not necessarily mean hitting the gym for hours a day. It is just about keeping active, which is a key part of ageing gracefully. "Menopause is changing your body and hence your exercise programme should be well-rounded with some cardiovascular exercise, flexibility and range-of-motion movements, weight-bearing exercises for muscular strength and endurance, deep breathing, and body awareness motions," says Mahmuda. Aerobic exercises include walking, jogging or doing dance exercises. These benefit your cardiovascular system and keep weight and heart problems at bay. It also keeps a check on depression and anxiety due to the release of the hormone endorphin into your blood stream. A 20-minute session, three or four days a week should do the trick. 54-year-old Hamida Bilquish, a Gold's Gym member says her workouts have reduced hot flashes to just a couple a day and that her waves of heat "shoot back up" whenever she skips exercise altogether. Menopausal hormonal changes also cause reduction in tendon and ligament flexibility and loss of muscle fibres. These can impede everyday activities like walking, lifting bags or even breathing and therefore need to be prevented. A range of simple stretches that include head and shoulder rolls, wrist and ankle circles, twisting your torso from side to side and touching each of your fingertips to your thumb can be miraculously helpful in relaxing the tendons. Muscle mass loss can be combated by some low-impact exercises such as repetitive arm raises, biceps curls with light dumbbells, standing from a sitting position, side leg raises and standing on your toes. Next on the list are the bones which lose mineral content, density and mass, and become fragile as the aging process progresses. Additionally, menopause can cause a substantial drop in oestrogen levels, accelerating the loss of bone mass leading to osteoporosis. Mahmuda recommends what is known as resistance training to prevent this. Two 20-minute sessions per week of strength training exercises, including biceps curls, lunges, knee extensions and seated arm curls would be a good start. Finally we look at the lungs, which lose capacity due to an aging process of constriction, shrinkage, rigidity and weakening of your bronchioles muscles. To counter this, learn the deep lung breathing taught in Pilates and apply it in moments of relaxation. You will calm your nerves and improve your lung health at the same time. 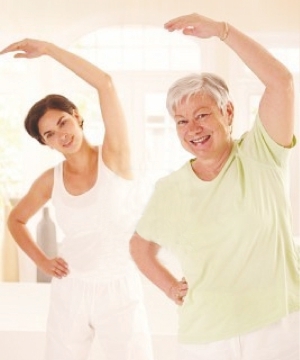 The benefits of regular customised exercising for women over 50 are many. Post menopause, oestrogen levels in women fall leading to the many symptoms of menopause. Though there is no scientific proof that exercise totally eliminates the symptoms of menopause, it seems you can certainly alleviate them. This may be due to the purely psychological impacts of exercising rather than actual physical changes brought about by exercise but what matters is that at the end of the day you will be fitter and happier no matter what the source. Books fulfill myriad functions in our lives. They foster our enthusiasms, provide information and lend a true sense of personality to every room, whether it is a cubbyhole of well-thumbed paperbacks within arm's reach of the bath, in a utilitarian kitchen, or in a charmingly cluttered home study, brimming with leather bound volumes. This week we discuss the best ways to fully highlight the beauty of the written word. An artfully positioned stack of books can lead the eye towards an unassuming but finely executed pencil sketch in the corner of the room; equally it can divert attention away from a window with its eyesore of a tower block beyond. In our homes, selective corners of books can create a vertical accent among beds, low coffee tables and sprawling sofas, but they should be arranged in strictly diminishing order of size for added stability. When decorating what is for most people, the biggest room in their homes, the one they spend the most time in and is the place where they usher in their visitors, planning is crucial. 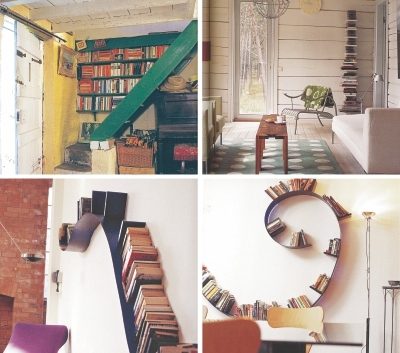 If you decide to combine books with ornaments, then you need sufficient place for ornamental goods in your shelves. 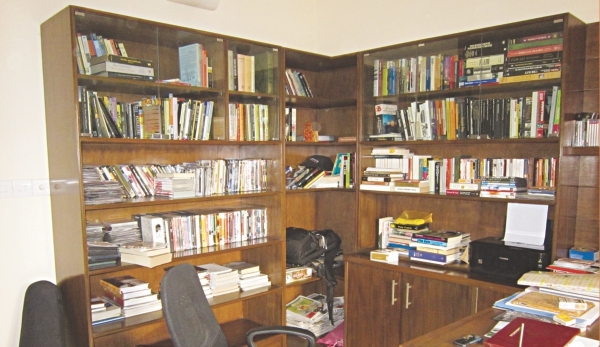 You can enhance the inherent symmetry of matching niches by similar-sized pictures above your books. Living rooms are also the places into which you welcome friends and family and inevitably a stack of books will inspire scrutiny and comment. The term “coffee-table book” used to be delivered with a sneer to imply the triumph of style over substance but some subjects really do deserve to be picture-ed. One can display books on top of the center-table and also on the lower platform. It is a different matter when it comes to reading for pleasure. The novel is ideal for the bedroom; it's an inherently intimate form, in which we are given privileged access to the interior feelings of functional characters. Sometimes we can create innovative designs cleverly on the top of bed in the form of a sleek bookshelf. A single open or closed shelf for current reading can solve your book searching time. Generally, space is limited in the study room so we can attach a day bed under the bookshelves carefully with proper dimension. Eccentricity is in the eye of the beholder, of course, but there are any number of whimsical eye catching and downright impractical options available for book owners wishing to make a visual statement. Odd forms, such as a plastic cow, a harp and a seesaw, have all been revamped to hold books. Apart from the single file galley, most modern kitchens are designed based on the idea of a triangle formed from the three functions of storage, preparation and cooking, with say the refrigerator, sink and cooker as the three vertices. Any fitted kitchen that you buy, however cheap, will these days be custom designed, so make sure you allocate space for cooking books and also some place for loose-leaf folders of passed on family favourites and enticing recipe clippings from newspapers and magazines. The space underneath a staircase makes the ideal spot for built-in ziggurat-style shelving unit either filling the whole space, or as one section of a compact home office. Another effective solution when the stairs dissect a space is to make them into a series of open-ended boxes that cascade upwards. Actually the space below the stairs is a great storage place. Generally this place is used for bicycles or other sports goods, sometimes it is ideal for shoe racks and umbrellas or stick holders, but if there is a little more space we can create a corner for magazine and papers. Books are essential for children. All of us who love books want to inculcate that love in our children. For children we can make eye-catching bookcases in numerous ways. Books add character to our homes and enrich our souls. They are an important testament to our intellectual pursuits and should thus have prioritised positioning in our homes. Bonsai is an art with living plants through which the mightiest of trees are miniaturised in sizes of around ten to twelve inches' height on a shallow/flat plant pot, while aesthetically preserving all its natural beauty and characteristics. Take a seedling and plant it on a flat tray-type planter having irrigation holes on the bottom. Water everyday, apply fertiliser and pesticide every month. Keep in a light sunny place like in a balcony or verandah or perhaps atop the terrace under shed-net. The main task is to trim branches, especially from the top. Bend the remaining branches so that it may gradually gain an exquisite shape. Continue this procedure for about five years and you will find your Bonsai is almost ready for display. Using some secret techniques, the time-span for making a Bonsai may be reduced. For instance, collect a sapling, suitable for the purpose, aged about three to four years. You yourself can prune it with a secautor as per requirement, treat and nurse that for one or two years and thus achieve a Bonsai of your choice in a limited span of time. In many old buildings and their boundary walls, where civil maintenances were ignored, some matured but under-grown banyan trees (Ficus banglensis or Ficus religiosa) aged over five years can be seen. Collect these carefully along with roots, shape and plant it on a flat tray type planter after proper trimming-pruning, bending of branches, stretching or binding as per your choice. Here is a small list of species easily available and very much suitable for the Bonsai experiment in a Bangladeshi climate. Ornamental: Ficus banglensis, F. benjamina, F. elastic, F. diversifolia, F. aglomerata, F. krishnae, F. nitida, F. religiosa, F. retusa, F. salicifolia, F. triangularis, Azadarchta indica, Casaurina equisetifolia, Polyscia aralia, Juniperous barbadensis, J. chinensis 'pfitzeriana', J. horizontalis, Murraya koenigi, M. exotica, etc. Flowering: Acacia Arabica, Adenium obesum, Allamanda cathertica, A. scotii, Bougenvillea blondie, B. RR Pal, B. Isabel greensmith, B. lady mary baring, B. Mhara, B. Mary palmer, B. rao, B. roseville's delight, B. sanderiana, B. sonnet, B. spring festival, B. summer time, B. tomato red, B. thimma, Cuphea jorrulensis, Delonix regia, Duranta repens, Gardenia redicans, Ixora superb, I. chinensis, I. stricta, Jusminum grandiflorum, Lantana depressa, Millingtonia hortenensis, etc. Fruit bearing: Anacardium occidentale, Anona squamosa, Averrhoea carambola, Carissa carandus, Citrus aurantifolia, C. mitis, C. paradisi, Feronia lemonia, Acra/ Manilkara sapota, Phyllanthus acidus, Psidium guajava, P. cattleianum, Punica granatum, Tamarandus indica etc. If you feel that some technical training is required to start, you may join Sled Bonsai at Z/25, Tajmahal Road, Mohammadpur, Dhaka-1207 for a 3-month Certificate Course (# 0171 662 6872). Besides a hobby, Bonsai trees can also be a fantastic way of earning. Bonsai can be exported mainly to Middle Eastern and European countries, or may be marketed locally through fairs and exhibitions, showrooms or personal contacts. The author is a professional Landscape Architect/Consultant. For any co-operation or counseling regarding Bonsai creation, commercial terrace farming, etc., e-mail: sledbd@yahoo.com. Japan is well-known as the mother of the Bonsai culture. But the real story starts in China on 400 BC. Back then, there lived a famous poet named Tong Guen Shing, who was a statesman as well. Being uninterested in royal administrative tasks, he started planting trees in pots, something that hadn't been done before. Tong Guen Shing used to cultivate chrysanthemums of different varieties. Two years later came the Ti-Ang era. Paintings from that period showed images of big trees like Pines, Bamboos, Cypruss, etc. planted on flat tray pots. The next dynasty of China was Hans, which lasted till 206 BC. A contemporary specialist from this period used to make landscape on plates with miniature hills and mountains, river, forests and plants, houses, animals which were known in Chinese language as Pan-Ching. Besides, there was also a culture of creating Pansai, which soon became known as Bonsai in the Japanese language. In China, combination of Pan-Ching and Pan-Sai was called Pen-Jing. In the tenth and eleventh centuries, Chinese Buddhist saints took these Pan-Sai to Japan. They used to treat these as divine articles. Named 'the steps to the heavens' or 'Human's communication with God', Pan Sai became gifts during 1280 to 1368 AD when Japanese royalty or business-people used to visit China. A dramatic chain of events took place in 1644. With King Manchu began a feud with Chu Shan Sai, a Pansai specialist. Chu Shan Sai escaped to Japan with all his techniques to avoid persecution. Thus, the Bonsai culture started in Japan from that period and finally Bonsai was displayed in the first World Trade Fair. And this is the colourful history of the Bonsai plant. Mortein is one of the most successful brands of Reckitt Benckiser Bangladesh, a product, as you may already know, that provides strong protection from diseases caused by mosquitoes. Mortein recently launched a consumer promotional campaign named Mortein 50 Bhori Shonar Khoni. The drive began from 15 September, 2012 and will run till 30 November, 2012. Mortein is giving its consumers a chance to earn gold by participating in a competition where the contestants have a scope to win 50 bhori gold in 10 weeks time by explaining "why Mortein protection is the most powerful protection" with the unique code number on the pack via SMS/letter or facebook. The first prize giving ceremony had already taken place, at the head office of Reckitt Benckiser Bangladesh Limited on 18 October, 2012. The winners of the first 3 weeks were awarded with one bhori of gold coin each. 35 more consumers to go! The 3rd Certificate Award Ceremony of Music Planet School was held at Emmanuel's Banquet Hall in the city on the evening of 24 October. The ceremony was organised to honour the students and well-wishers of the institution. Tunes on violin, piano and guitar by young artists added to the proceedings. The Ambassador of the Kingdom of Netherlands to Bangladesh, H.E Gerben De Jong, attended the occasion as the chief guest and gave away the certificates. Architect Mustapha Khalid Palash, Chairman, Delvista Foundation and musicians Naquin Khan, Foad Naser Babu, Pilu Khan, Shakila Zafar and Partha Barua spoke at the ceremony as special guests. Managing Director of Music Planet, Saifuddin Saki, Dept. Head of Music Planet, Labu Rahman and Audio Engineer Instructor, Shamim Ahmed, spoke about audio engineering possibility in Bangladesh. The ceremony ended with a beautiful performance by noted band Feedback. Most Eid, the wedding season has officially kicked off. If you or one of your dear ones are getting married this fall, the following days of your life promises to be fun and exciting -- but hectic as well. Hence, planning carefully is of paramount importance. Welcome to When Dreams Come True, a three day exhibition at Drik Gallery (House # 58, Road # 15A, Dhanmondi) that is going to start from 8 November and will run till 10 November from 3pm to 8pm. Organised by Rose Petal Décor, an organisation that provides complete wedding (and other events) solutions, and The Dreamcatchers, a team of photographers. The exhibition includes wedding and birthday décor, wedding photography, videography, free mehendi, etc. Attractive packages will also be offered. For further information, call 01917714433.